DOWNSIZERS and families with racing stripes have moved in to the first of eight residential towers being created in the $1.2 billion transformation of Brisbane’s racecourse precinct which officially opens tonight. Ascot House, which has an 800 sqm roof terrace and elevated pool deck overlooking the racetrack, was the first milestone in the Ascot Green development by Brisbane Racing Club and Mirvac. 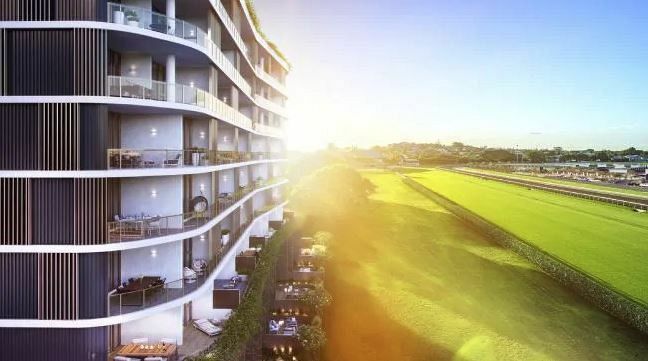 Mirvac Queensland residential development general manager Warwick Bible said buyers were drawn to the trackside location and generous balconies overlooking the turf. “Many of our buyers are moving from Ascot and the surrounding areas from big family homes. They are seeking generous floorplans, extra-large balconies and open outlooks, making Ascot House incredibly attractive. New resident Russell Reed, who has been a race day ambassador entertaining winners at Saturday meetings, won’t have far to walk to catch all the action. Having been a member of QTC, BTC and BRC for almost four decades, he can’t wait to see horses running past his veranda. He and wife Jenny were among downsizers moving furniture into the building this week, in his case downsizing from a house in Brisbane’s north. Mr Reed has turf in his blood, coming from a cattle and crop farming family at Kingaroy that raced horses in Brisbane. “Both my grandfather and father raced horses in Brisbane. They had a bit of success with horses at Eagle Farm, Doomben and Albion Park trained by Merv Lewis at Gumdale but nothing major,” he said.